Lerici è situato in una insenatura del Golfo dei Poeti a sud di La Spezia. Il paese è soprannominato "la perla del golfo" per la sua straordinaria bellezza. The area around the Gulf of Poets attracted many writers in the early 19th century and the English poet Lord Byron spent some of his life here. 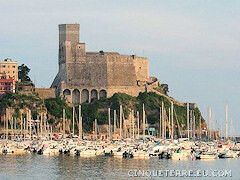 Today Lerici is a picturesque seaside resort with a small tourist marina. It still preserves traces of its historic past, like the imposing Pisan-Genoese Castle. The town has a small historic quarter and the crescent-shaped piazza with its wave tiles is a pleasant place to sit. The two public beaches in Lerici are lovely and there is a large port. You will find several hotels and seafood restaurants in the area. You can take one of the hiking trails through the Park Montemarcello to the small nearby fishing villages Fiascherino and Tellaro which are among the most beautiful villages of Italy and certainly deserve a visit. During the summer months ferries depart from Lerici daily for the Cinque Terre, Portovenere, Levanto, Portofino and Genova. • One of the main sights of the town is the 13th century castle built by Pisani on the headland which once controlled the entrance to the Gulf of La Spezia. Today it is the home of the Museum of Palaeontology. • The original church of San Francesco, with framework and pilasters made of Carrara marble, dates back to the 13th century. In the 18th century, the church was restructured. 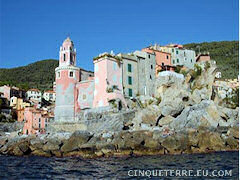 • The nearby fishing villages Fiascherino and Tellaro which are among the most beautiful villages of Italy. • The Park Montemarcello with tracks for hiking and mountain biking. • The Gulf compete, on the first Sunday of August, to win the Palio aboard hand made boats built by local artisans. The sport competition is preceded by parades, events and shows and finishes late in the evening with a fireworks displays.